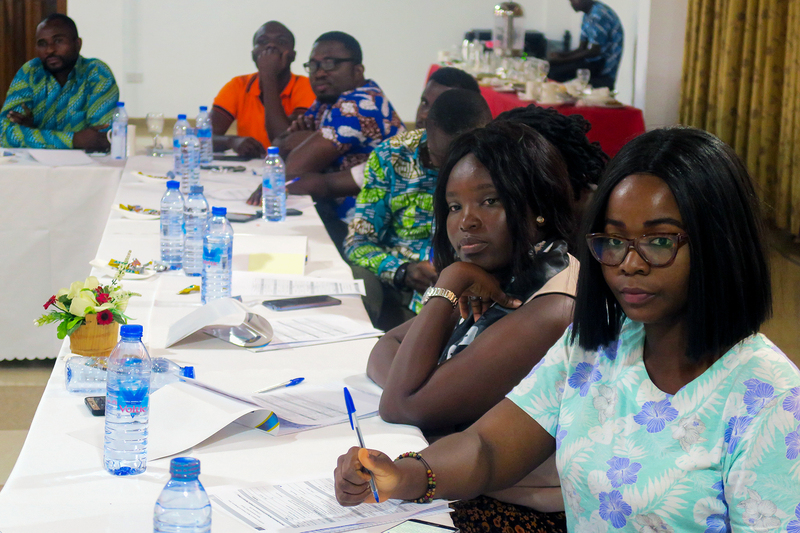 Accra – The UN Migration Agency, IOM, trained 58 Ghanaians journalists on awareness raising and reporting on irregular migration during two workshops organized (27/09-02/10) in the Western and Brong Ahafo Regions, two main migration-prone areas in Ghana. In recent years, media coverage of irregular migration and of migrants’ stories have been on the rise in both Europe and West Africa. While broadcasting migrant narratives may create awareness on the risks during the journey in the countries of departure, storytelling has not engineered behavioural change and youth are still migrating irregularly. Funded by the European Union Emergency Trust Fund for Africa (EUTF) as part of the EU-IOM Joint Initiative for Migrant Protection and Reintegration, the two workshops provided journalists with an in-depth overview on the situation along the migratory routes in West Africa towards Europe as well as a training on key terminology and legal instruments. As key players in shaping public debate, the journalists also received a training on awareness raising, ethical reporting and data protection. “Media should target not only the potential migrants but their immediate family members and friends as they are crucial to the behavioural change we engineer,” said Collins Yeboah, Community Outreach Assistant at IOM Ghana. “Media should showcase livelihood options and avenues for skills development in communities,” he added. The workshops led to the creation of a guide for journalists when interviewing vulnerable migrants (returnees, victims of trafficking, etc.) and resulted in the creation of “Migration Reporters”, a working group and association gathering Ghanaian journalists to support the awareness raising and outreach objectives of IOM. The association aims at developing a national awareness raising campaign to be implemented across the country. “When reality hit me hard on the road after our second robbery, I regretted taking that dangerous journey…I still regret to not have asked for advice before going,” said Salifou, a Ghanaian who was assisted to return from Libya. Since 2015, over 13,500 Ghanaians arrived in Italy by boat in search of better opportunities – making Ghanaians one of the main nationality to arrive on Italian shores. As of August 31, IOM’s Displacement Tracking Matrix reveals that 46,726 Ghanaians are currently stranded in Libya (which amounts to 7% of total migrants in the country). “Awareness raising on irregular migration is about relaying information on the risks but also on the positive alternatives already existing home. Raising awareness is not only about launching a campaign but also about creating a constant and trustful environment where people are not ashamed to talk about what they have experienced” said Florence Kim, IOM’s regional media and communications officer for West and Central Africa. “This is our shared responsibility to ensure that no more young West Africans die along the route because “they did not know”, because they were ashamed to seek advices, or because they did not believe there were opportunities at home,” she added. The training is part of the larger awareness-raising strategy of the EU-IOM Joint Initiative for Migrant Protection and Reintegration Assistance, developed to inform potential migrants, communities of origin and the public about the dangers of and the alternatives to irregular migration. More than 200 journalists have been trained by IOM in 6 West and Central African countries since 2017. Through the EU-IOM Joint Initiative launched in May 2017, IOM Ghana supported the return of over 800 Ghanaians, primarily from Libya but also from Niger, Mali and Burkina Faso, of which one fourth returned to Brong Ahafo Region.